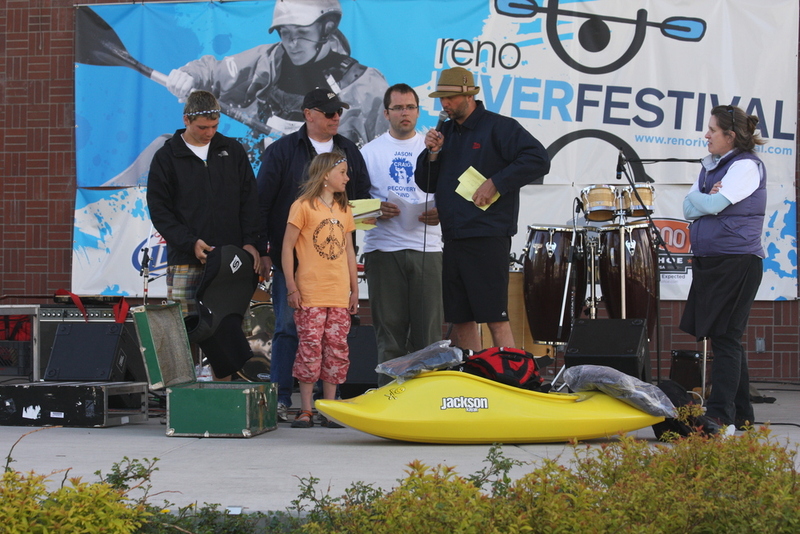 This weekend I competed in The Reno River Festival where I had a great time and I was happy to see all of my friends. I competed in freestyle on Friday and I was 2nd behind Hannah Kertesz, and Emery Tillman was 3rd. It was held in hole 3 on the North Channel but the water was very high so it was flushy. We each had 3 rides and the best ride counted. Even though it was flushy I still was able to get my loop, round house, and spin. For Men’s Freestyle Stephen Wright, Eric Jackson, and Dustin Urban were the top 3. For Women’s Freestyle Ruth Gordan Ebens, Emily Jackson, and Erin Clancy were the top 3. Saturday was the slalom race and I was 3rd in Women’s open and E.J. was 1st in men’s open. The weather was perfect and the river was even higher making it a challenging course. Thanks for the great course Charlie! Sunday was boater cross and I made it into the 2nd round where I took a paddle to my face so I finished 4th. As always, I enjoyed meeting people and talking to kids about kayaking throughout the weekend, and the festival was also a great fundraiser for my friend Jason Craig who was injured in a kayaking accident and my friend Daniel and I picked the raffle tickets for great prizes. Thank you for putting on a great event! Stay in the loop with Sage as she travels across the country to compete in kayak competitions and trains for the 2020 Olympics in Rio. You can also sign up for Sage's email updates here.